Do you want to build your career in the IT industry of Bangladesh? IT is one of the most used terms of the current world when it comes to technology. Also, it’s the short form of Information Technology, which is a big one but often said simply. So, there are best career ideas that relate IT industry is as much attractive as high demanding. If we look at the IT industry of Bangladesh then the same image is also in this country. As IT workers are highly specialized in their field, they’re often just called “IT nerds.” And chances are that there’s an IT professional behind it all making sure the cogs in the machine function properly If a company relies on phones and emails. Besides, the real benefit of being the behind-the-scenes technological lifeblood of a company is the excellent pay is your reward that’s more often than not. What are the Top 10 Best Career Ideas in the IT Industry in Bangladesh? Expect the requirements of IT professionals to be vast as ever as the economy finds its footing and more jobs open up. It means that there is a wide space with the best career ideas in this industry than many others. If you have a little idea about the IT sector then you should know that IT jobs are not only well-paid but in-demand as well. Moreover, the report says that the industry is the fastest growing and it will continue to the next decade at least. Also, IT jobs are as important to an organization’s success as most highly demanded ones. 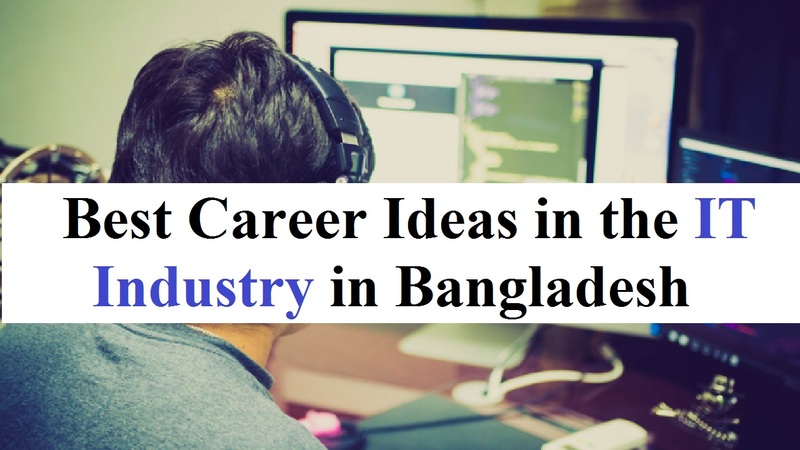 Well, let’s know what the top 10 best career ideas that are dominating the IT industry in Bangladesh. The work of being an IT consultant is as vague as it sounds and it’s ranking on the top of the IT industry. Your job is to evaluate the systems and do the research that no one else entirely understands in this position. As the experts put it, everyone from local startups to the Fortune 500 companies needs IT, consultants, to help them figure out the cheapest and fastest ways to run computers better. Like most positions on this list, a bachelor’s degree in computer science definitely helps. Also, there are recommendations regarding IT that the IT consultant specializing in a niche category to help focus on the kind of experience he or she gets. Although the term may sound new, you may hear of cloud computing of course. It still needs to be organized and given architecture for the storage space existing in the ether can’t be touched literally. This is the job that relates to the IT industry. The job requires a bachelor’s degree from computer science and one of the highest paying IT jobs. This is the job of a computer crime detective that’s known as computer forensic investigators search for, identify and evaluate information from computer systems, often for trial evidence. The job requires a degree either in computer forensics or information security or cybersecurity. Also, it’ll be helpful if you have a Certification from a computer examiner board. This is one of the latest and best career ideas in IT sector of Bangladesh that pays higher remuneration as well. As major changes going on in healthcare due to some acts and the gradual transition to electronic health records, the health IT is a blossoming field. Although health IT specialists will mix computer knowledge will record-keeping skills, specialties in medical coding, billing, and cancer registry are also in demand. And supervisory technician positions call for bachelors and master’s degrees while some health IT jobs require only an associate degree and/or certification. We know and it’s a really along with the current trend that most people you know have Smartphone and/or tablet computers. The use of mobile tech is predicted to exceed personal computers at some time in 2018 according to the experts. That’s why IT professionals with experience in this field getting more preference as the businesses are more heavily relying on them. Developers will create programs for future iOS and Android devices while using basic coding languages. If you want to be a mobile app developer then you must be a bachelor in software engineering, computer science, mobile computer or related fields. This job also has the option of freelancing and a way to earn most than a regular job. If you’re a jack of all trade then you should be a web developer. Although they create web pages, web applications, and web content, their skill set requires them to have an excellent understanding of what makes a good operating system etc. If you like video games and want to design the next Facebook than the job is for you. The programs we run on our mobile devices and personal computers, there are software engineers behind these. When you’re a software engineer, there is a very wide range of niche fields you can work in. and the job requires to have a bachelor’s degree in either software engineering or a related field is best. Besides, this job also has the option of freelancing and a way to earn most than a regular job. When it comes to software and hardware vendor managers oversee supply. It means that anything from Microsoft’s latest word processor to health IT programs for hospitals. Although computer science degrees are helpful, a deep understanding of business or even an MBA could clinch a job. Although Geographic Information Systems are complicated, it’s exciting and getting more every day. In order to evaluate and communicate trends and patterns in visually stylish, GIS tech uses geographic data. It requires certificate programs and degrees and both improve job outlook. Data Modeler is a position that stands to translates poorly without jargon. Also, it’s the job that creates data designs and defines relationships between data fields. Its modeling needs to work perfectly since any company’s data is vital. The job not only requires a bachelor’s degree in computer science, mathematics or IT but job experience as well.